I also got my bag for Cabarete packed, and made a valiant start on the stuff for Seattle. There’s something that’s just crazy about making a decision today about what I’m going to be wearing in two weeks, but I’m starting to wrap my head around it. 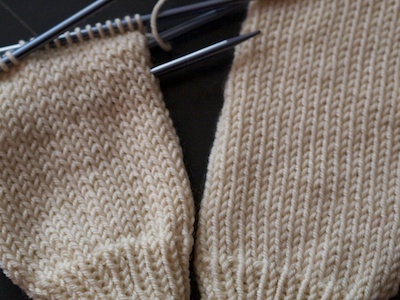 Also yesterday, I made a piddling bit of progress on Joe’s socks. Yarn: STR Lightweight: Pining 4 Ewe, Pattern: Old Joe, I’m knitting the large. Jammed on the closest teenaged foot for clarity. Joe’s Christmas socks are always last. There’s something about great, big, conservatively coloured socks that I always put off, and then, considering that there’s way more feminine than masculine sock patterns out there (especially the way Joe defines them) and the next thing you know it’s late December and I’m getting all sweaty about finishing his, and a lot of years, I don’t make it. Joe’s always been awesome about this, happy to have socks arrive no matter when they come, but I thought that this year I would make a special effort to get it together early. (I’ve actually vowed to get a lot of Christmas knitting together early, we’ll see how it goes.) In any case, I am absolutely determined to bash out a pair of socks for him, first, before anyone else, and that meant bashing out a pattern. This Christmas my Joe thought that the socks I made for his dad (Old Joe) were "fancy". An idea was born and Voila, Old Joe. A sock pattern that I think has everything going for it. It’s elegant, sinple, easy to memorize, comes in small, medium and large, is unisex and cozy. Perfect for a bunch of people on my list, and hopefully yours. With that, off I go. 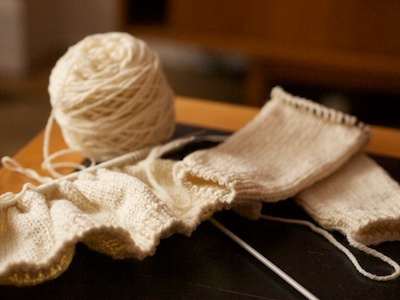 I still have no decision about the knitting for the trip – beyond the socks for Joe – and truthfully, I kinda hope they’re done before I get there. A lot of you made a wonderful case for lace, and I was pretty sure that’s where I was going, until Claudia suggested another Color Affection, and I felt a little something give way. Turns out that may not have totally worn off yet. We shall see. A month ago, when I was booking the flight to the Dominican Republic, I sat with my sister and my mum, and we scoured over the calendar, looking for the best dates to come and go. Mum had the spot booked starting the 2nd, and I had to be in Seattle for Madrona on the 13th, so I said I’d book to come back on the 11th. I’d land, wash my clothes, sort out my family, do a load of laundry, gather the stuff I need for all the classes, and then relaunch in the other direction, continentally speaking. Erin talked with the travel guy on the phone and a few minutes later it turns out that it is grossly less expensive to come home on the 12th. That’s a tight fit, I think. That’s going to be really hard – I have a lot to do for Madrona, I should take the more expensive ticket to come home on the 11th, and then suddenly it hit me like a bag of hammers. What kind of idiot pays more money for less time in the Caribbean? Not this gal. I told Erin to book it, and she did, and forwarded me ticket and on closer examination, while my flight leaves the Dominican on the 12th, I don’t get home until the 13th and man – is it going to be one tight turnaround. although all that needs is buttonbands (and I don’t have the buttons, but let’s slide right by that one, there’s no need to cloud the issue with facts and logic) and on top of that I have to wind just slightly more than 300 ten metre balls of yarn for class materials, print off my handouts (after beating the ¢?§¶•ªº¡ing printer into some kind of ^&(*&^$?¢§ing submission) and pull together a charity event and buy sunscreen and crap I forgot the laundry and prescriptions and … I have to pick what knitting I’ll take. Somehow… that’s the hardest thing. Despite the crazed number of things I have to accomplish, I keep finding myself drifting to the stash and poking through, and I’m on the edge of having someone change my Ravelry password for me to force me to stop cruising the patterns. I need something small (has to fit in a suitcase) and something interesting for when I have time to focus (plane, beach) and something plain for when I can’t – though I think I have that covered with a pair of plain socks, and the Old Joe ones I’ve just got on the go. They’re simple. Beyond that, the world is my oyster. I have 18 days of knitting to plan. Generally speaking, I am someone who experiences a great deal of guilt. Now, mostly I don’t mind. I think that a whole lot of the time guilt is there to make you feel bad about crappy things you’ve done so that you don’t do them again. It’s nature’s little correction system, and I have high standards for myself that I fail to live up to now and again (often) and so it makes sense that I would feel guilty when I blow it. That lousy feeling is worth avoiding. Guilt, I believe, it mostly there to tell you when you’re doing something bad or being a jerk. It’s like a warning system that rings an alarm when I’m coming off the path. I know that’s not always true about guilt. When the kids were little and summer vacation would end, I would just about weep with joy. I would be a good, loving and committed mother all summer long. We’d go to the park and do crafts and have no TV and it would be beautiful for the kids, and I wouldn’t resent it all (much) and then the first day of school would come and I’d drop the three of them off and then be the mum in the schoolyard wishing them a happy day and pretending like I was going to miss them… then trying to get all the other parents to high five me and hug the minute that the door to the school closed with them on the other side of it. Always, while I was trying to kiss some random woman on the mouth in a pure human expression of happiness, there would be some mother – you know the one, she exists in every schoolyard in the world, the mum who says "Oh no. I hate the first day of school. I miss my children so much when they aren’t with me" and it would hit me like a train. A train with a snowplow on the front of it. Guilt. A big crushing tsunami of guilt that I didn’t love my children enough to want to be with them all the time. It would always take a few minutes for me to remember the truth. You’re not a crap mum if you think it’s really okay to enjoy a cup of coffee without someone throwing a lego in it. Without someone yelling "SHE’S LOOKING OUT MY WINDOW." I wasn’t a bad mother because I wanted to pee by myself just once or twice a year. I’d put down the guilt and walk away. 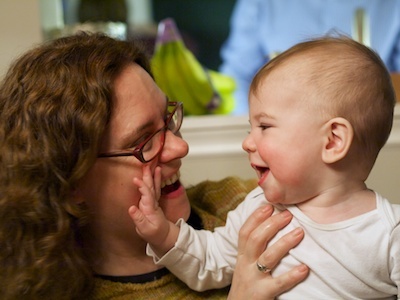 I could define good mothering for myself, and I had. That mum’s feelings were hers, not mine. Guilt is a feeling you’re supposed to experience when you cross your moral line, not the moral line of the lady down the street. I try hard not to confuse the first and second types. Is it my moral line, or someone else’s? Is my guilt appropriate? (I let myself down) or inappropriate? (I let that lady down.) Mostly now that I’m middle aged I have the difference straight, though I have to check in regularly. Now the only sort of guilt I can’t cope with is the third type. The kind I feel when I get something nice, or luxurious. You know what I mean? Like when I’m in the grocery store buying organic milk and that bread made with nine kinds of sprouted seeds while wearing my cashmere scarf and new coat, and the guy in line in front of me is scraping up pennies for pasta, an apple and some carrots for the kid with him, A kid who could really use a scarf at all, never mind cashmere. You know that kind of guilt? Sometimes when I talk about this kind of guilt, the conversations I have are confusing to me. They have been since I was little, and here I am, a big, grown up lady and I still can’t cope. When I articulate these feelings, this sense of feeling bad and guilty for having nice things, invariably someone tells me that I shouldn’t feel bad, that I deserve these things, and that I work hard to afford them, and that I have earned the luxury. They’re probably right. It’s not like Joe and I are rich. We budget really carefully each month, making decisions about where our money goes, and why. If we want something nice, like to go out to dinner, we have to look at the money and make some decisions. We work hard – we probably do deserve the things that we have been able to buy. The thing is, and this is where it gets hard for me, who is to say that the guy in the supermarket who was scraping up the pennies – Who’s to say that he doesn’t deserve the sprouted grains bread too? The odds are pretty good that the guy works harder than I do. Years ago I worked at a community centre for a segment of the population that tends to be low-income, and at risk. I was way broke back then, and while I had a grocery budget that was ridiculously low (see aforementioned pasta, apple and carrots) we were never hungry. A lot of these people were. A lot of them would feed their kids and not themselves, because they had to make choices, and here’s the killer. Most of them had two jobs. A full time crappy job and a part time crappy job, just to make ends barely meet. They were working way, way more hours than I was, at jobs that I think are much harder than what I was doing. There was a voice in the back of my head back then, and it’s still there now. That voice wonders, if you deserve the money you get, if I earned the right to have nice things, then how come these people aren’t? Do secretaries work that much harder than the guy scrubbing the toilets at the local? Does a big time baseball player work that much harder than the secretary? I know it’s complicated, I know that people are going to say all kinds of stuff like maybe that poor person should have gotten an education, or maybe Warren Buffett really is so smart that he deserves billions of dollars, or… I don’t know. A thousand things that make it harder to quantify what people are worth – and all that stuff is true too. The problem is that when push comes to shove, we’re all told that if you work hard and do what you’re supposed to do then you will get what you deserve, and I think living in a society that believes that? I think that’s gotta feel like total crap if you’re a 57 year old taxi driver working 60 hours a week in Toronto, trying your best to pay the bills. Especially if you’re an immigrant from a war torn country where you were a surgeon. I’m sure, if you’re that immigrant, you understand what happened, and what choices you made, and all that – but I bet it makes that taxi driver want to take people who imply that you straight up get what you deserve depending on how hard you work for a long, long ride with the fare running the whole time. I don’t know what the answer to this sort of guilt is. I do my best to spread my good fortune around, I offer time and money to organizations that are working for a society I would like to live in – I vote for politicians who are mostly going to do work that reflects my belief that you don’t always get what you deserve, and that sometimes circumstances or bad luck conspire against people, and that we all need a society that reflects that. It doesn’t help much. Mostly I still feel guilty when I have something nice. I’ve heard the argument that I’m not comfortable with nice things because my self esteem is low. I’m willing to buy that on some level – but really, it isn’t that I don’t think I deserve a rest, or a vacation, or cashmere. It’s that I really think that most people do- and I feel bad having something that they’re not, when they’re just as hardworking and worthy as I am. More worthy a lot of the time. I don’t even have to put on pants to go to work most days. Anyway, I apologize for the ramble. This whole thing was brought on by my realization that I hadn’t told you guys that I’m going on vacation next week – and then realized that I hadn’t told you because I feel guilty that I’m getting something nice. Something nice I totally worked for, saved up for and earned – and still have really, really complex feelings about. 4. The baby getting the sweater. 5. Why he is getting a sweater. 6. Any little that likes all my jokes can have anything they want. 7. Don’t tell that to my kids. Thanks so much guys, for all of your amazing comments and compliments yesterday. I promise I’ve gotten more out of the blog than you have, but it’s absolutely charming that you feel like it’s a two way street. Onward! As you will recall, when we had last seen our intrepid knitter (that would be me) she had decided to knit Little Lou Hoo a sweater, then, following a poor experience with a gauge swatch (fine. It was a sleeve) had thrown a minor hissy fit and turned her back on commercial yarn. There’s nothing like a failed gauge attempt to knock the will to knit right off of you. I decided to change to handspun, and started spinning the singles right away. 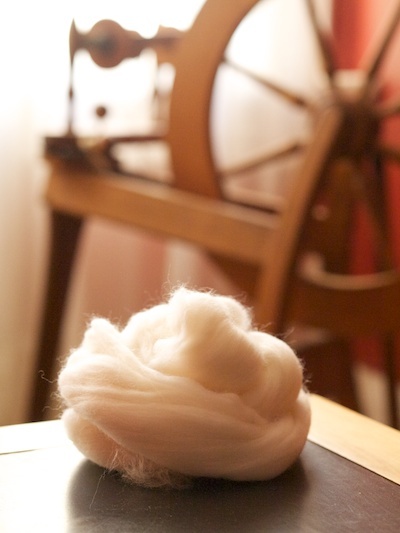 I’d talked to a few spinners, and checked in with my common sense, and I felt pretty confident that if I spun three big, full bobbins, that when I plied I would have enough 3 ply handspun. I did exactly that, but something weird happened. 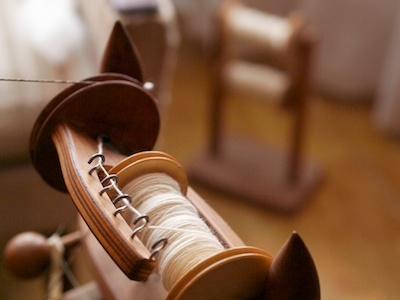 I plied together my singles, then sent them for a lovely bath to take the last of the oils out of the wool, and to set the twist. Think of it like a kind of blocking. After the skeins were washed I pressed most of the water out of them in a towel, then snapped them a few times to sort them out, then hung them over the railing to dry. Dry they did, and in the morning I got a bit of a shock. My skeins looked short. They’d absolutely changed length, and when I picked up the skeins to play with them, I figured out why. This wool is merino. 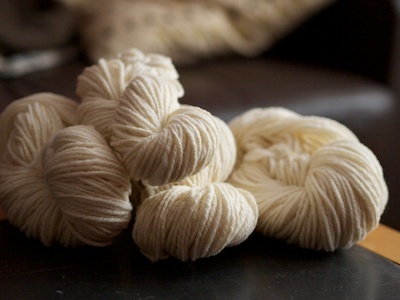 Merino is super, super crimpy, and crimp in wool is like curl in hair. I’ve got curly hair, and for a while I had this hairdresser who (I believe) thought my sister was really good looking. (She is.) We both went to see him for our hair, and he was always trying to convince me to straighten my hair like my sister’s. He was always saying how nice it would be, and how I would love it. (I had to work a great deal on not taking it personally that he obviously preferred her hair.) One time I broke down, and after he cut my hair I let him blow dry it and brush it all straight. It was totally creepy – and really long, once you took the curl out. For the whole rest of the day I kept passing mirrors and saying hi to my sister before remembering that it was me. By three in the afternoon I’d decided to wash it to bring my curl back, that’s how freaky it was. I jumped in the bath, dunked myself and whammo, curly girl again. 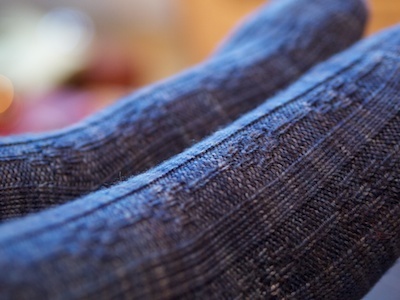 Wool works the same way – and this is merino top. 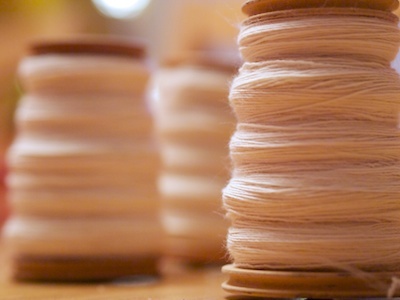 Roving is carded fiber, the fibres are all jumbled, and then sold in a rope… but top is combed fibre. All the individual strands of merino have been combed so they are all parallel, and the process works a little like a hair straightener. (It still comes in a rope though.) 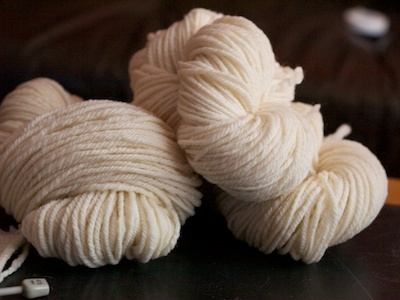 I spun them while they were straight, and plied them while they were straight and then when I gave them their bath, they stopped being my sister and started being me, and all the crimp came back, and the yarn shrunk up – and there you have the most squishy, scrumptious, deliciously soft and bouncy yarn…. and not enough yardage. It’s crazy, because I can pick up the skeins and slip my hands into them and when I pull my hands apart the yarn is so stretchy that it’s practically an elastic. It’s like I’ve spun a hair tie or something. It will stretch out to the yardage I was expecting (or closer to it) but then when I let go, all that crimp pulls it back in. I love it. Now, mark my words, it just so happens that I believe that I have already spun enough yarn for this baby sweater. I keep picking up the three skeins I have and giving them a big squish and thinking that it has just got to be enough, but in a moment of tremendous maturity, I have decided to spin a little more. The pattern says 360 yards, and it’s written by a nice Canadian who wouldn’t lie to me, so I’m going to take Alexa’s word for it and spin a little more. Then I am making a sweater. I am so excited. On this day of the year, nine years ago, I sat at our family computer and stared at a blank page for a good long time, then looked up at Ken and said "What now?" "Blog" he said. "Just start. See what happens." I did. I wrote my first blog entry. It took hours. I had trouble putting a picture in, and I needed a lot of help. Ken had set this blog up as a present for me, and although there are a multitude of reasons why Ken is a fine and fabulous friend, he deserves to be sainted for what he did to make the blog go over the rather sharp curve of my learning over the next few months years. I had no idea what I was doing, and I don’t just mean the computer part. Back then, everyone was a blogger. 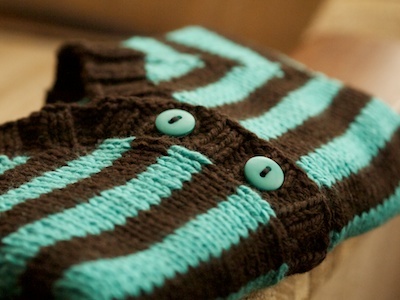 I wanted a blog so that I could be part of the huge knit-blogging community – man, it looked like so much fun. I was right about that. It is fun – but it has turned out to be so much more. It has been the gateway to all of you, and the amazing impact you’ve had on my life. It’s made me a better writer, and definitely a better photographer. (I cringe at those early pictures.) It has brought no end of incredible people and experiences into my life and my career, and I honestly can’t imagine not doing it – and what, and who my life would be missing if I hadn’t ever done it at all. It has been a remarkable trip, and remains the best gift anyone has ever given me. Beyond all that, and that is so much, it is more. Some families have photo albums. We do too – and framed pictures of us on the walls. The girls at different ages, Hank as a tiny baby. Our parents, our siblings, trips. The one thing missing is pictures of me. There are so few, compared to the millions I take of everyone else. I’ve started trying to fix it over the last few years. Handing over the camera to other people in the family, asking them to try and get me in a picture or two, or trying to buck the urge to shimmy out of every picture the minute the camera comes out. I hate it. I hate how I look and the strange way my nose is, and my glasses, and I’m heavier than I wish I was and I always look so clumsy and awkward to myself. It’s like when you hear your own voice recorded, and it’s always strange? Everyone thinks "I sound like that? That’s what you’re all hearing?" I’m forever seeing pictures of myself and thinking "I look like that? I am walking around and that’s how I look?" It’s enough to make you avoid it forever, but the truth is that when I flip through those albums, it is like the children have a ghost mother. Especially when they were little. There are so many pictures of them, hundreds of Erin and Hank, and me? I’m the nowhere mum. I’m not comfortable with this. I’m not comfortable with my absence in those pictures, and I’m not comfortable with being in the pictures either, but I am trying, because while I am never, ever going to wish there were more pictures of me… I bet my grandchildren or great-grandchildren will. 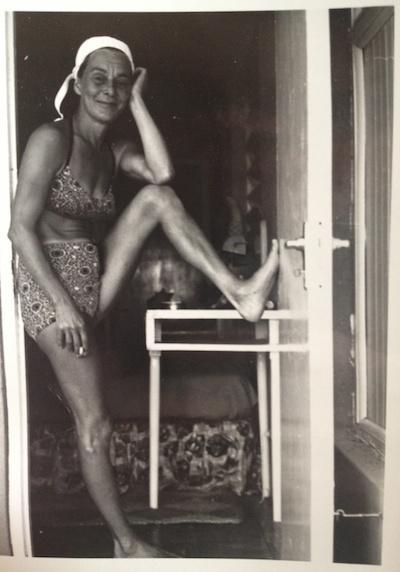 I love the pictures I have of my Grammy. I miss her, and I wish I had more. It helps me remember the smell of her and the sound of her and what she thought and did. It helps me hold onto who she was, even though she has been gone for so long. I realized this morning though, as I celebrated nine years of blogging by flipping through my own archives, that I am not the Nowhere Mum. I am here. I wrote it all down, and so many of our family stories are here, and when my daughters or granddaughters want to think about who I was and try to remember how I smelled or what I thought about them, or what I thought about when they were growing up, they won’t have just a few pictures of their awkward and clumsy mum. Happy Anniversary Blog. Thanks for nine years. I wouldn’t have written it without all of you here to read it. Sam has been trying to get us, to wear matching outfits for years. I don’t know what her fascination is, or why she’s so keen on it. Maybe it’s a weird throwback, some sort of attachment that hasn’t quite been cast off in the wave of "I don’t want to be anything like you" that is growing up, but she loves the idea. She doesn’t want us to wear the same outfit entirely (except for the footie pajamas she thought we should get at Christmas, an idea that had all the chance of working that I have of being mistaken for Beyoncé) but she does regularly suggest that we get the same shirt, or the same coat… I can’t explain it. It’s an odd little quirk. I’ve asked her why she likes the idea, and she always just says "Because it’s awesome?" She’ll suggest a matching outfit, then smile to herself like it’s the most satisfying idea in the world. Then I shudder and we drop the idea. I’m middle aged. She’s 18. One of us is going to look dumb if we get the same clothes. I have stressed several times that we will not be getting matching outfits. The other night Sam was headed out the door and complained that she didn’t have a hat. 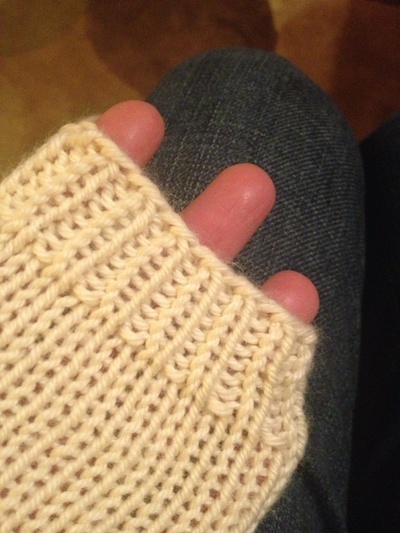 (She said this just like I am a negligent knitter/mother, rather than that she is the negligent teen who loses them.) She was going out and I was staying in, so I told her to take mine. Remember mine? It’s Wurm, knit out of Cascade Eco+. I love it. She grabbed it, and went out and came back and said that she really, really needed a hat, and that she needed this hat. We had the standard chat about how my things aren’t her things, and then, suffering some sort of maternal pang of affection for the little hat-stealer, I decided to knit her one. (Truthfully, I figured making her a hat would increase the life expectancy of my own.) A few questions later and it turned out that she really liked my hat exactly – and I remembered that I had enough Eco+ left over from Hank’s sweater.. so two evenings later – Sam has a hat. Pattern: Wurm. Yarn: Cascade Eco+ in "Ranier" Eight repeats instead of ten. Otherwise, knit just as written. I gave it to her this morning as she was leaving for school, and asked if I could snap a few quick pictures. 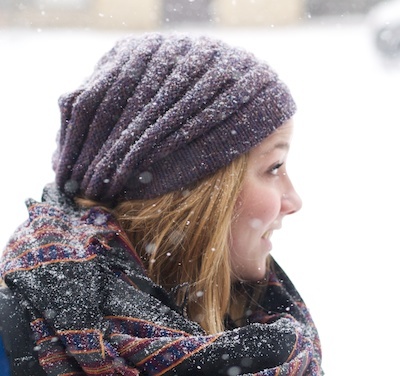 She was grateful for the hat, and thrilled that it matched her coat, and extra happy it had arrived today. 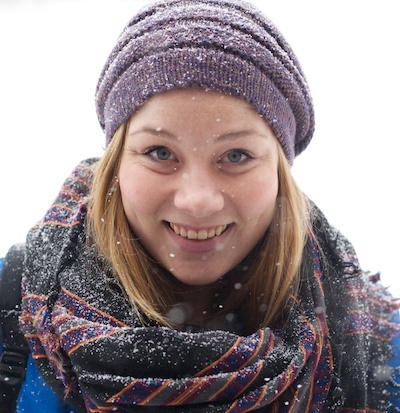 (It’s super cold and snowy.) As she tugged it over her ears, and looked up at me, a broad smile spread across her face. I said "Oh, you like your hat, I’m so glad" and the smile became epic. "WE MATCH!" she beamed, and off she went. I can’t believe she got me. I never saw it coming. The pattern was loosely based on the Rocketry sweater, but I took the opportunity to change some stuff to make it better suit my needs. I kept the slight vee-neck, believing as I do that it is better suited to the particulars of the physique of the very young, who often lack necks. I’ve always thought that the a round neck wasn’t quite right for a little one, and I’ve noticed that their parents seldom button that top button, the one that would settle under their fat chins – so I left it out entirely. 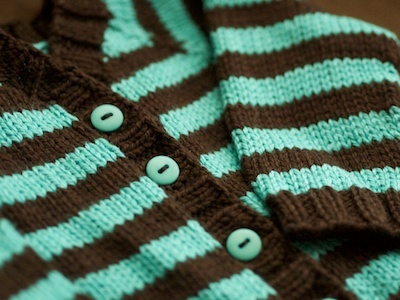 The yarn is Spud and Chloe Sweater, a rather delicious confection. (Colours were 7503 "Root Beer" and 7507 "Moonlight", one of each. Special thanks to Jennifer at The Purple Purl, who chose the colours. I’d have never picked them, but love it.) 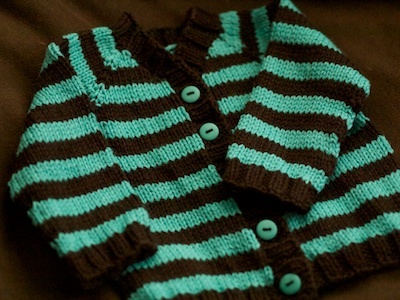 a delicious mix of 55% superwash wool and 45% organic cotton, perfect for a baby. I altered the bottom to include a ribbed edge, and added slightly mitered buttonbands, because the original Rocketry sweater had a roundish bottom that didn’t suit my desire for a tailored look – because, you know, babies like a tailored look. My mum found wee buttons that matched the yarn exactly, and I did the math to space five of them top to bottom. My mum picked it up today, to drop off to the intended baby, who I know won’t care about any of it, except it is soft, and doesn’t have a button that insults his lack of a neck, and will keep him warm for some time to come. I love that I don’t know this baby, he’s the son of a friend of my mum’s, and I’ve never met him, and probably never will, but there he will be. Sitting warm and cozy in the Canadian winter, spitting up on the handwork of a knitter he’s never known. Oh Knitting. I love you. It has been an odd few days here, as I wrestle with a to-do list that isn’t horrific, but seems to be intractable. Despite hours of diligent work, it’s just one of those lists that won’t shift. At the end of the day all I am crossing off is things like "make dinner" and "tidy desk" and "drink coffee" (and I only put that on there so I would have something to cross off.) I can’t shift the big ones, like "get ready for Madrona". I know that what’s wrong is that my list is too holistic – I’ve got big stuff on there like it’s one item when really it’s a whole bunch of little jobs that all have to be completed before the thing is done. In reality, I’m totally kicking arse and taking names, I just don’t get to cross anything of of the fraking list until I’ve done all the little jobs, and that’s lame. I love crossing things off the list. When Meg was little, she used to freak out when she saw a big job in front of her. 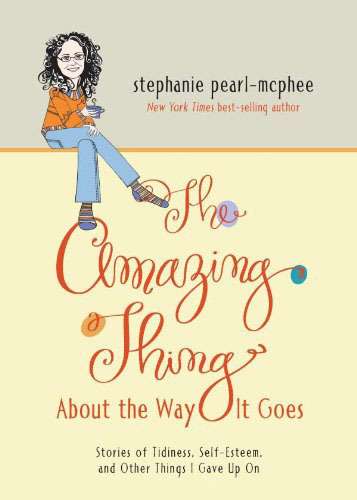 It turns out that she’s a really holistic thinker – she sees the entirety of the task ahead and gets overwhelmed. Her teacher that year (who was pretty much an angel, a brilliant, brilliant angel) said that she needed to learn to chunk tasks. You don’t have to learn a hundred spelling words this month. You need to learn three today, and three tomorrow… it’s not that big a job if you split into easy little chunks. Don’t look ahead, don’t see the big picture. It’s too big. 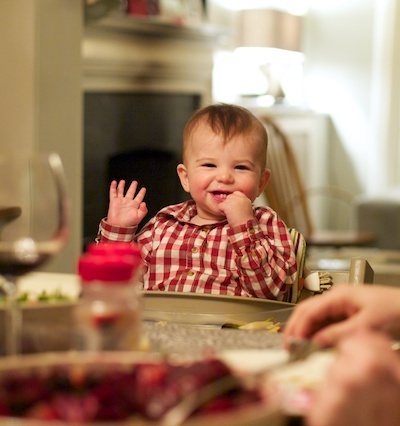 He was right, and the whole family has been practicing "chunking" ever since then – and I realized this morning that even though I’ve known this since then, and practiced it – I have overlooked doing it on my to-do list. "Get ready for Madrona" is a huge job, and really it’s a whole bunch of jobs and sitting there on my to-do list like a leviathan, I’m not going to be able to cross it off until the 12th of February. If I split it up? I might be able to make some visible progress on the stinking list. Do math for button band. 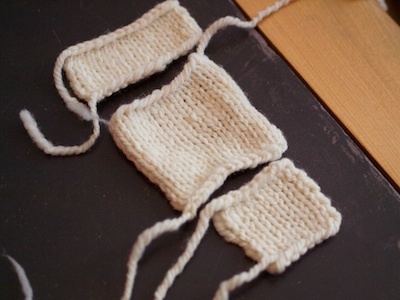 Ply a little bit and knit some swatches to see if it’s right. 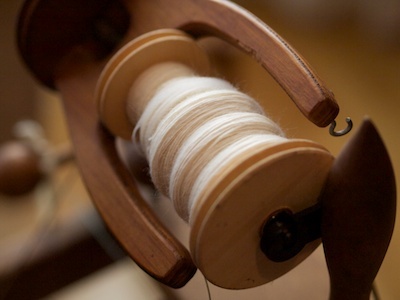 Spin yet another full bobbin. I wouldn’t get to cross much off there, but at least I can see something resembling progress. Something that keeps me from transferring everything on today’s list onto tomorrow’s list like it’s some horrible textile version of Groundhog Day. "Make Lou a sweater" indeed. I’m going to go re-write my whole list. It will be a lot longer, but at least I’ll finally get to cross something off. So last night I’m in this completely foul mood, forcing myself to be nice and civil and kind – and I decide to work on a little sweater. Not the blue and brown one, because all it needs is button bands, and they’re fussy and I hate them and it just didn’t seem like they were going to improve my mood at all, but nothing cheers me up more than a new thing, so that’s where I went. I need to have another little sweater in the works, a birthday sweater for Lou, and I’ve been enchanted with Antler, so that’s what I’m thinking. 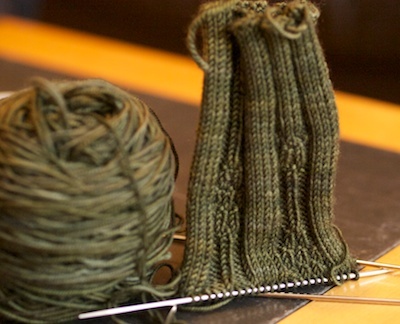 The thing is, it calls for Aran weight yarn – and I didn’t have any in cream handy, so I bought Tanis Green Label Aran. I love this yarn. Bouncy, nice tight ply that will show up the cables really well, consistent, soft, superwash… it’s got everything going for it in the baby sweater department. 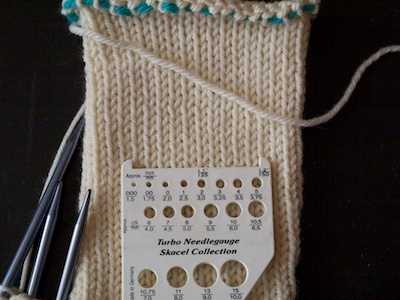 I knit a sleeve for a gauge swatch – I do that a lot for baby sweaters. If it works out, you’ve got a sleeve, and if it doesn’t, well then, it’s only a sleeve. I don’t mind ripping it out, or at least not much, or not usually. I’d started a sleeve, realized the fabric was way too open, and had my first concerns about yarn/pattern compatibility. I ripped it back, went down a needle size, and finished a whole sleeve. 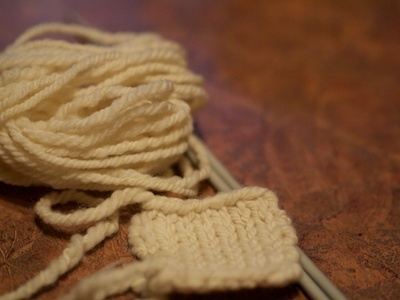 I still thought things were too open, but it is a natural coloured yarn- not dyed at all, and sometimes that means that it can be a little compressed. I find that dyed yarns are less likely to bloom or puff up when I wash them, but that’s sometimes not the case with yarn that hasn’t had a bath yet (dye or otherwise) so I sent the little sleeve for a swim, laid it out to dry, and then, because I am almost terminally optimistic, even in the face of awesome evidence to the contrary, I started the other one. This morning I went and fetched it. You can see there’s been very little change. (Unblocked on the left, blocked on the right.) Things are tidier, the stitches neatened up a lot (right there, I feel like that’s the best evidence I can show you for why you wash/wet block knitting) and the yarn rounded out and bloomed a tiny bit, but not enough to change the gauge. It’s still too loose for me to be happy with. I’m already at a perfect 20 sts/10cm, and the pattern calls for 18, and going down a needle size would likely give me 22…and that my friends, that means that unless I’m willing to re-write the pattern for a DK weight yarn, which I’m not… I’ve got the wrong yarn for this pattern. 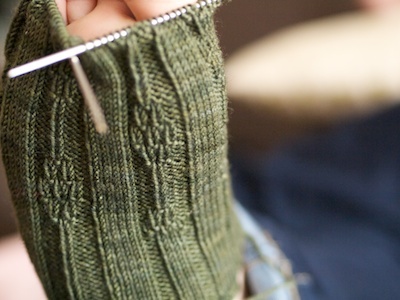 (It also means, that the Green label Aran is a beautiful, lovely, well constructed yarn that probably isn’t actually an aran weight, or at least isn’t for this old-school knitter with this idea of how knitting should look.) I was pretty bummed, and I set it aside so I could have a proper pout. I really, really wanted this yarn to work, and it’s not going to, and now I have to go to the store and buy some yarn because I don’t have any natural coloured aran weight yarn, and then, then I had an epiphany. 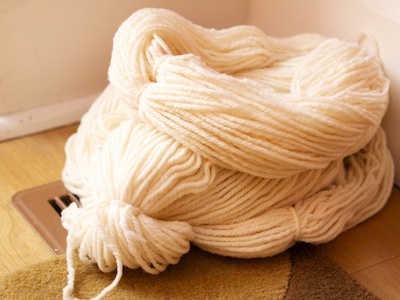 I know how to make yarn. Things might be looking up.